Marvel Pictures is on to phase two with Guardians of the Galaxy coming soon and Captain America, Thor, and Iron Man sequels on the horizon. Michael Bay is doing laps around the 1980s with both Transformers and Teenage Mutant Ninja Turtles. G.I. Joe 2 is finally hitting theaters. Warner Bros. is already talking about rebooting Batman as The Justice League comes closer to reality. Even a Voltron movie is in development. There are no action fantasy properties left for Hollywood to adapt! The well is dry. Even Disney has simply resorted to bringing back Star Wars. Never say never: Here comes a Robotech movie. The Hollywood Reporter reported on Thursday that Warner Bros. is going to make a major adaptation of the 1980s cartoon series on the scale of Paramount Pictures’ Bay-produced Transformers movies. Producer Akiva Goldsman (I Am Legend) and Tobey Maguire (Spider-man) have hired commercial director Ni Mathieu to helm the movie. Robotech is a particularly strange cartoon to adapt, as the series was actually made using re-appropriated footage of a Japanese cartoon called Macross. The two share in common the central hook: The humans of the future pilot enormous bi-pedal robots to do battle with aliens seeking a fotress that crash landed on Earth and inspired a wave of new technology, including the mech-ships. Guillermo del Toro is already making Warner Bros a humans-in-robots movie called Pacific Rim, but unlike that movie, Robotech’s pilots are fighting aliens rather than monsters – plus: its giant robots also turn into spaceships. The studio is banking on audience hunger for giant robots to be limitless. 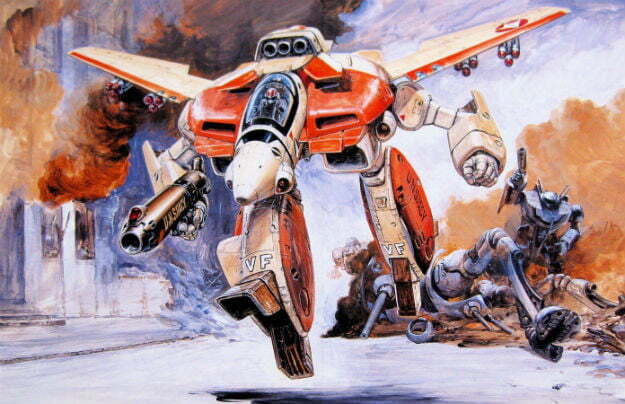 Robotech has producers and a director, but that’s far from a guarantee that the movie will actually get made. Warner Bros. has been reticent to fund a number of Akiva Goldsman’s more ambitious, effects-heavy projects. Just two years ago the producer teamed with Ron Howard to begin work on a multi-film and television series adaptation of Stephen King’s The Dark Tower novels. An obscure property like Robotech will likely be pushed aside if more lucrative projects require the money. For example, Goldsman is also producing a movie of DC Comics character Lobo. As Warner Bros.’ is desperate to recreate the success of The Dark Knight, films like Lobo may hit theaters long before Robotech does.